My 3 year old is really interested in the circus lately. It started with an Olivia book but I've been trying to find other ways to engage her with the circus theme. She still really likes obstacle courses and it has become one of our favorite things to do when we have time alone when baby brother is sleeping. 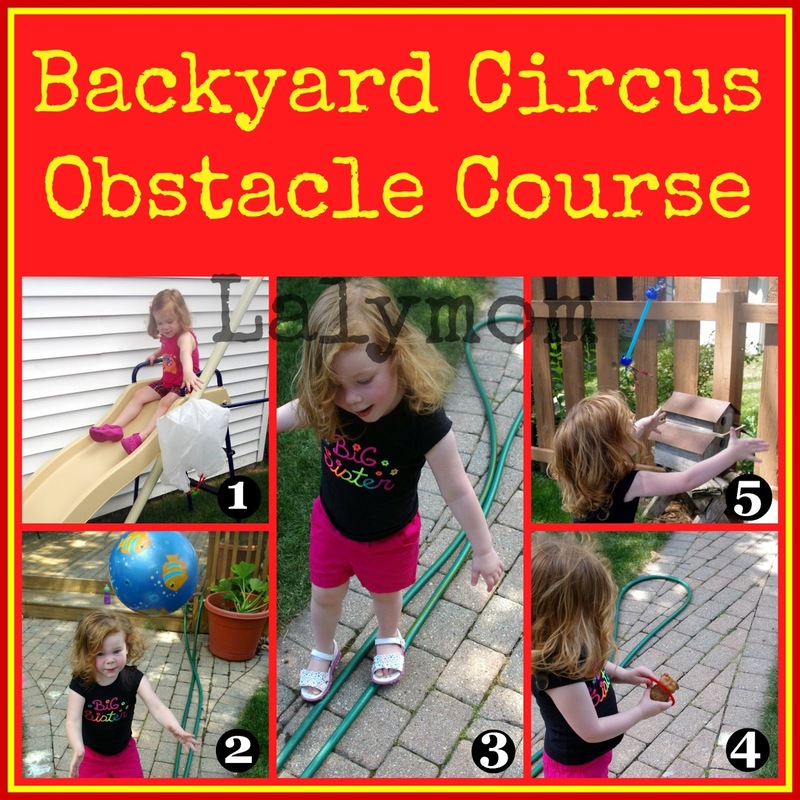 This backyard circus obstacle course came about when I saw her walking on the garden hose like a balance beam, which made me think of a tightrope. It ended up being a cooperative process- she came up with as many of the obstacle ideas as I did! This was a fun creative exercise for us because we did use some toys but we also used things already in our back yard. My daughter seems to be a visual learner so I demonstrated our obstacle course first, over exaggerating for fun. I held my arms out to my side on the tightrope walk and wobbled and acted like I might fall. If your child is not visual, you could simply tell them or for older children you could write it out. One of my favorite things about this activity is the ringmaster. While one person runs the obstacle course the other person is the ringmaster introducing the acts. “Ladies and Gentlemen, welcome to the circus! For our first act, the Amazing…(name here)!” “There goes the parachute and she is down the slide!” “Next is our juggler!” etc… and at the last station you finish with a ta-daaa! And the runner takes her bow! ETA: Kristina from School Time Snippets wrote in asking if we used the clown nose from our top 10 Pouch Cap Craft guest post. We didn't but we sure will next time! THANKS! Notice the different outfits…we have now done this several days in a row. This is also why additional obstacles added that were not pictured. This has been such a fun way to engage my 3 year old's imagination but also to get some gross motor skills practice. If you are looking for obstacle course ideas, I invite you to check out all of our obstacle courses a well as my Gross Motor Activities Pinterest board for lots of ideas in that area. Is this your first time here? Please follow along over on our facebook and pinterest pages so you don't miss any of the fun! Previous Post: « Mondrian for Kids and Baby Too! Awww, super cute idea! Did she wear her Pouch Cap clown nose?! I love the idea of a circus obstacle course. The red nose picture is adorable. These are great ideas — we’re always looking for interesting things to do outside. Thanks! So many wonderful ideas. I am so glad you came by to share today!! What fun! I think a circus obstacle course would be a lot of fun. 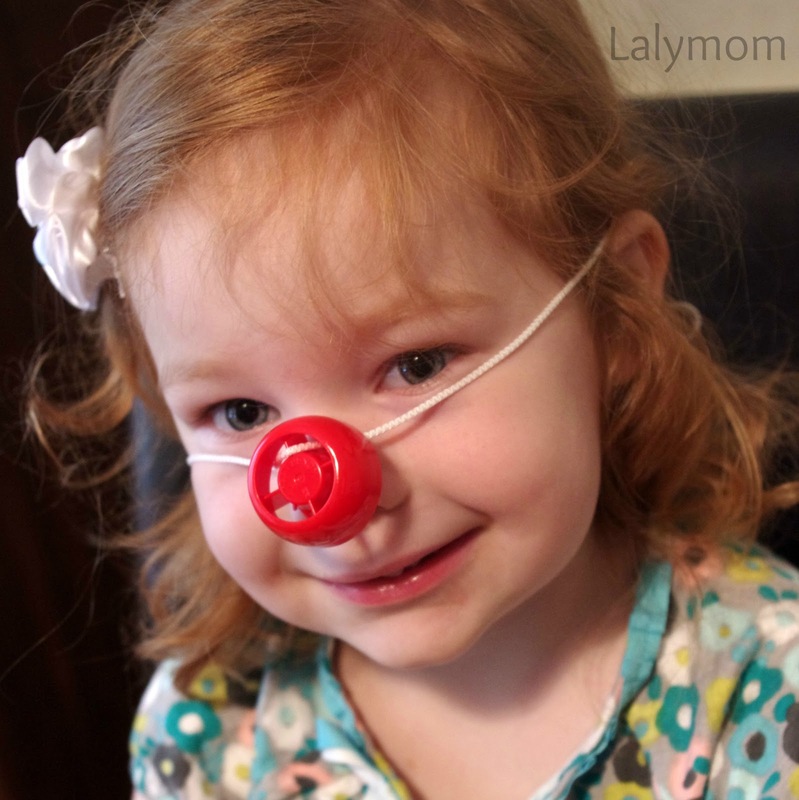 This is so cute, and such a fun way to practice motor skills! Thanks for sharing at Mom’s Library! Really great idea! Thanks for sharing this. Hopped over from Mom’s Library! I love this Laura!!! So much fun!! 🙂 The pouch cap clown nose is too cute! 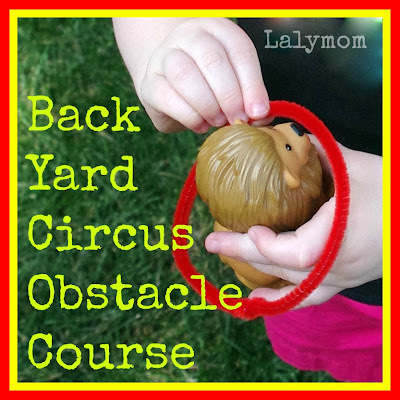 We love a good obstacle course and our boys also have a circus fascination so this would go down well. Thanks for stopping by the Outdoor Play Party I’m off to pin.